...and then sneak in something you don't need to do at all but just feel like spending time on. That's Wayson's cowl up there. It's not a Christmas present but sort of a cold-weather present, which means January would also be fine. In fact it would be especially fine because unlike my other cowl projects, the stitch on this one is a little bit slow to work. On the other hand, it's a really simple stitch that produces a lot of texture and won't fold over - so many cowls do end up folding up on themselves and while that feature can look fine on a woman, it takes quite a man to carry it off. And I wanted to write up the pattern as a little gift to you guys, in time before Christmas to be a help to you if you were looking for such a thing for somebody on your list. 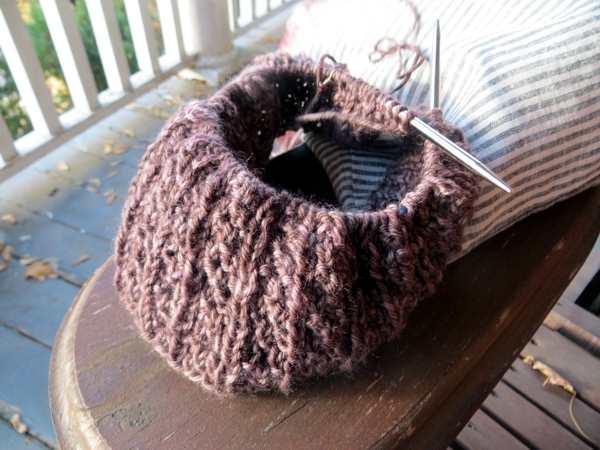 So: in between socks, I'm sneaking in stitches on Wayson's brown cowl. And the farther I go, the more I am enjoying it, because the yarn (Twisted Fiber Art Duchess, a DK weight superwash wool, knit at a pretty loose gauge) is getting softer and softer with every inch. The knit-purl texture makes holding it as I knit feel increasingly like petting a super soft poodle that's just out of the groomer's. I hope you are going to be working on some irresponsible things this weekend too and I will see you again on Monday! With, hopefully, a much more sensible outlook on my knitting because OMIGOSH, November is already halfway done.